So we’ve had an eventful few days of Eternal Masters spoilers, and wow does this look like a set that’s worth $10 per pack…maybe. I need to see the whole list and even then I’m going to be leery. Today I want to look at the mythics that have been spoiled so far and think about what they will be worth, even taking a stab at the foil prices. I want to organize myself with the printings it’s had before as well. I’m noting the current prices, too, in case they start to slide abruptly. Editorial note: As of this writing, there’s only 14 mythics previewed. I’ll update this as more are revealed. Very important to note that this is banned in Commander but it is pretty amazing in Legacy when it comes to dealing with things like Emrakul, the Aeons Torn. I think that there isn’t much demand for this card, to be honest. It’s not too amazing in Cube and it’s not played in high quantities in Legacy. I’m going to say that this ends up about $60 and $150 for the foil. Existing copies are not going to fall very far, since the supply is pretty small. This printing is going to be the nail in the coffin for its price. It’s played in some decks in Legacy but it’s banned in Modern and doesn’t see a lot of casual play. The price isn’t very high for a Mirrodin rare, and injecting more copies will lower the price by at least a third. This Mox will be about $10, but hit a high $50 or so in foil, because Volkan Baga is a real, honest, badass artist and this is gorgeous. This is likely going to be the most expensive card from the set, in foil and not. Amazingly, this isn’t banned in Commander yet, and that’s despite one of the banning principles being ‘fast mana.’ I don’t know if you’ve ever played with one of these, but the 3 damage can add up. However, it’s two full turns ahead of what other people are doing, and that is why I’m leery. I think that this stays at $100/$250 foil, but I also think it gets the ban within a year. Not very many people have these in their Commander decks, and as that number goes up, so will the calls for a banning. Oh, this card is busted right in half. It’s just so good. So very, very, amazingly good. It’s possible you can miss with one of the cascades, but your deck is still amazing and getting the first spell or two off the top plus the big hasty creature. Of special note is that this set has the top-of-the-library tutors for the Wanderer, or bounce it back to your hand with Karakas every turn to make your opponent cry. Value-wise, I expect this to settle at about the $15/$40 range. Yes, you’re seeing the foil multiplier right. This is a $400 foil due to Vintage players who will pay anything for the foil version of something. The foil supply on this is super small (check out Marchesa, the Black Rose in foil too!) and that’s where the impact will be felt greatest, I think. Stealing a Mox or something is good, but don’t overlook the draw two, discard two. There’s a lot of decks that can use that effect, and Dack does pop up here and there in Legacy. The nonfoil will be about $20 and the foil will still be in the $150 range, and I’d expect the original foil to bottom out about $300, since there’s just so few copies out there. This is one of the two really awful pulls for a mythic. It’s infinite mana with this and Animate Dead, so if you’ve got something to do with all that mana, great, it’s game over. If not, get back to your game. This is going to have a very low price, likely about $1/$5. While this has had four times in print, including a special foil, I do not see this as being terribly expensive. It’s an amazing effect, and can draw a silly amount of cards at all points. This will be about $5/$30 at the end of the set. Oh, this is going to be interesting. 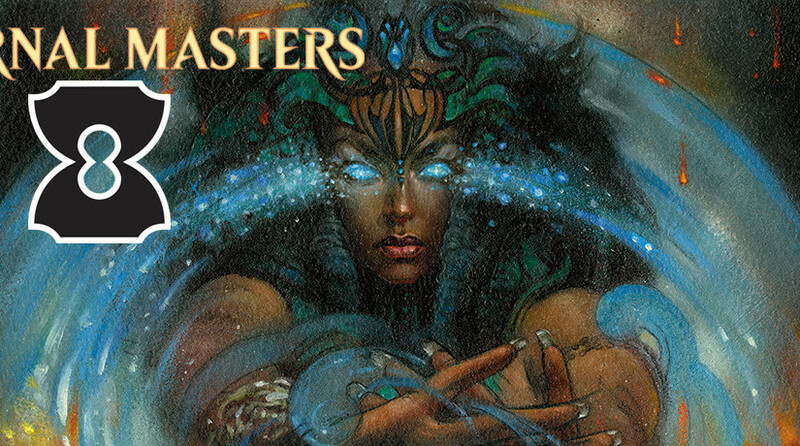 Terese Nielsen has become one of the most iconic artists that Magic has to offer, and this piece is no exception. Force will always carry a high price in Legacy and Vintage, because it’s a playset or bust. Very few people run only three, and that’s always kept demand high. This should settle out in the $50 range, but I think foils are going to be in the $200 range, especially early on. The presence of the special Judge version means that there’s both a ceiling and a competitor, price-wise. The part I’m unsure about is how much having this particular art is worth. Sneak Attack just wrecks face in a deck that can take advantage of it. Sacrifice for value, mass reanimate, do something unfair. This card enables a lot of that, but the price will stay reasonable, probably around $20/$50. My only beef with this card is that the EMA art is a bit too close to the original art for Necropotence, but that’s me being nitpicky. I think this is gorgeous, and the foils will reflect that. $15 for the regular, $80 or so in foil. Ah, Jace. How many things contributed to your overblown power? How many people made mistakes with you? It’s iconic, and likely going to be the best planeswalker ever made. This will be about $30, with foils being near $100. The FtV version is lower because a lot of people don’t like the unusual foiling on those cards. This is one of those cards that fills the ‘overpowered to busted in Limited, worth less than a bag of beans in person’ slot that every set needs. I think this will be just about bulk, and the foils might make it to $10. She’s best friends with Rabid Wombat, she can’t help you by herself, she was the most feared 0/1 until Noble Hierarch showed up…and she’s going to have a middling price, since she’s not played too much. I would expect her to settle about $10/$35. This is Tinker for green creatures. Progenitus is the usual target, but you have options in Regal Force or Craterhoof Behemoth, depending on the board state. Thankfully, this is using the dignified art, but it’s not going to be that expensive. $15 for the regular, and about $40 for the foil. Mishra’s Workshop will get a ban before Mana Crypt. Karakas may not be a 4-of, but any white deck in Legacy and Vintage needs a good excuse to not run one. I think it will hold value. Thanks for that Article, always nice to get more insight of what you guys think! Quick question for you : what’s your argument behind Jace @ 30$? Do you think the WW will however retain it’s value? Yeah, there’s no way Jace could go to $30. It’s preselling for $75 right now. Compare to Chrome Mox, which is preselling for $15 and you predict to end up at $10, which is a reasonable price drop. But there’s no way that Jace, which has always been a Mythic, is going to lose $45 off his presale value. I doubt he goes below $60. I’m quite a pessimist about prices. Preorder prices don’t mean much to me, not with the smell of $20 Thing in the Ice lingering in the air. I think that this printing of Jace will have the lowest price yet. Perhaps you’re right and he’s closer to $60 than $30 but we will have to see. You’ve got Dack at $20 and Jace at $30. I’ll give you 4 EMA Dack Faydens for your 2 EMA Jaces. How can you turn that down, you’re totally pants-ing me!!!!! All that value you’re gaining!! Maelstrom Wanderer is also in the Planechase 2012 deck Chaos Reigns, which will be included in the Planechase Anthologies box set. How does this affect the price? Karakas is ran plenty in Legacy. It’s a 3 or 4x in Death and Taxes, shows up in almost every sideboard and is main boarded in almost every Lands deck every built. It sees plenty of play. I am mostly concerned with the statement that Karakas isn’t all that in Cube! The card can do ridiculous things in your own deck and randomly gives you protection against some of the most busted things on the other side of the table!